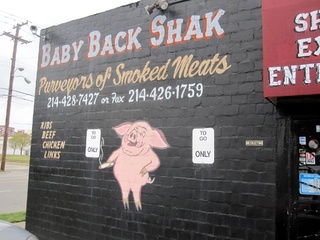 Baby Back Shak, 15 years and running, holds down the fort for Memphis-style BBQ in Dallas. Calling this place “nothing fancy” is an understatement; everything’s in Styrofoam, so if you’re environmentally minded, bring your own Tupperware. You can get your meat by the pound or on a two- or three-meat combo platter, with pretty much all the meats: brisket, turkey, ribs, chicken, sausage, boudain or half Cornish hen oh my. Or do a baked potato filled with your choice of two meats and drizzled with sauce. Ribs are the pick. Coleslaw flavored with mustard is another yes. The walls display photos of athletes and blues/soul legends like Ray Charles.